Add Locker Room Sports to your favorite stores and receive our exclusive emails about new items and special promotions! SIGNED 1978 TOPPS NEW YORK ISLANDERS ROOKIE CARD. After an autograph passes PSA/DNA authentication, it is then eligible for grading. The experts are simply grading the condition of the autograph. They are not grading the penmanship or legibility of the signature; they are grading the quality of the autograph in context, based on the writing habits of the signer. The autographs are graded on a scale of 1-10 with 10 being best. This service is available for items signed on any medium; however, signed baseballs have a different grading standard. The Overall Approach As a general reminder, the basis of autograph grading really comes down to the degree of strength and weakness within the signature, with an emphasis on eye-appeal and presentation. A PSA Gem Mint 10 autograph is a virtually perfect autograph. Attributes include bold writing with the absence of skipping or retracing by the original signer or otherwise. In addition, the autograph must be strong and clear for that particular signer. For example, if a genuine Mickey Mantle autograph is bold but seems rushed or slightly uncharacteristic in formation (though genuine) it may not receive a Gem Mint 10 grade. A PSA Gem Mint 10 autograph must not only be aesthetically beautiful in terms of placement but it must also be representative of the common/traditional autograph patterns of that person. A PSA Mint 9 is a superb condition autograph that exhibits only one of the following minor flaws: A very light skip (almost unrecognizable to the naked eye), a slight acceptable variance in boldness of the autograph (still very bold and clearly readable - even at arms length - but perhaps not quite as bold as an autograph that would qualify for a PSA Gem Mint 10) or a some other aesthetic issue such as undesirable location if the location of the autograph hinders the eye-appeal of the autograph, slightly, in some way. A PSA NM-MT 8 is a super high-end autograph that may appear to qualify as a Mint 9 at first glance but upon closer inspection, the autograph may exhibit one or more of the following: A slightly more noticeable skip in the autograph (though still very minor in nature) slightly inferior boldness of the autograph or very slight fading (the autograph must still be completely legible and intact), or some other aesthetic issue such as undesirable location if the location of the autograph hinders the eye-appeal of the autograph, slightly, in some way. For example, a very light bleed on one of the letters may be acceptable if minor or some very minor unevenness to the signature if the uneven nature of the autograph is limited to a small area - no greater than approximately 20% of the signature. A very light retrace, by the original signer, may be acceptable. A PSA Near Mint 7 is a very strong autograph that may suffer from one or more of the following: The signature, while still entirely visible to the naked eye, may exhibit some minor degree of even fading to the entire signature. A minor blemish or the existence of wear on the actual autograph may be acceptable within the NM 7 grade. Slightly more significant skipping or bleeding may be present, however, still insignificant to the overall presentation. Any other aesthetic flaw that may hinder the eye-appeal may be allowable. For example, an autograph that extends more noticeably into an undesirable area of a photo such as a darkened background. In addition, a very slight retrace, by the original signer, may be acceptable. A PSA EX-MT 6 is a very presentable autograph that may suffer from one or more of the following: The signature, though entirely legible to the naked eye, may exhibit some degree of even fading to the entire signature - more so than would be acceptable for a PSA NM 7. A minor blemish to one of more of the letters may be acceptable if the balance of the autograph is considerably strong for the grade. Slightly more advanced degrees of skipping or bleeding may be present in comparison to the allowable tolerance for a PSA NM 7. The location of the autograph may also be a more significant issue within this grade if the display quality is hindered in a more dramatic way. With PSA EX 5 autographs; aging is becoming evident. The autograph, by this stage, has lost the luster of a bold autograph but it can still be deciphered with the naked eye. Smudging in a limited area of the autograph may be present along with more advanced stages of fading or skipping with possible blemishes in a few minor areas. The presentation of a PSA EX 5 autograph is still clear but the defects have begun to affect the eye-appeal in a more obvious way. In addition, a more significant retrace, though still limited to approximately 25% or less of the signature, by the original signer, may be acceptable. A PSA VG-EX 4 is an autograph that may be subject to noticeable areas of advanced fading where some letters within the signature can only be deciphered under close scrutiny. Major eye-appeal issues have begun to set in, however, the autograph must still be approximately 75% visible to the naked eye. Advanced degrees of the above mentioned defects might be more noticeable with the PSA VG-EX 4 grade. In addition, a more significant retrace, though still limited to approximately 35% or less of the signature, by the original signer, may be acceptable. A PSA VG 3 is an autograph that is noticeably faded throughout. The autograph must still be approximately 50% visible to the naked eye. Advanced degrees of the above mentioned defects might be more noticeable at this stage with major eye-appeal issues clearly visible. For example, a surface defect on the item itself that has, in essence, removed a small part of the signature, may be acceptable within this grade. A PSA Good 2 is an autograph that exhibits significant flaws throughout. The autograph may have lost up to approximately 75% of it visible content, to the naked eye. Even under close scrutiny, the entire autograph may not be decipherable but clear enough to determined authenticity. Major advancement of a variety of defects may be present, causing a significant loss of eye-appeal. A PSA PR-FR autograph is one that exhibits extreme loss of eye-appeal and can barely be deciphered, even under close scrutiny - by experts. At this stage, the autograph is virtually unrecognizable to the naked eye and even experts may need the assistance of advanced technology in order to identify the signer. Most of the autograph may be worn away or faded leaving, perhaps, on a few visible letters or worse. 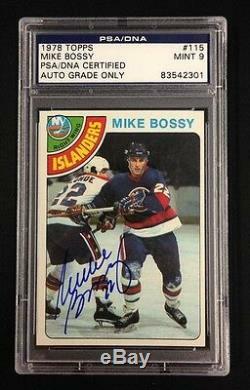 The item "MIKE BOSSY SIGNED 1978 TOPPS NEW YORK ISLANDERS ROOKIE CARD PSA/DNA MINT 9" is in sale since Tuesday, June 24, 2014. This item is in the category "Sports Mem, Cards & Fan Shop\Sports Trading Cards\Ice Hockey Cards". The seller is "locker_room_sports" and is located in Allen Park, Michigan. This item can be shipped worldwide.